Enjoy this Cute Flower Purse Pattern! Cute for a make up bag, a little girl, or just for fun! Dimensions: 6 inches X 7 inches. Now fold it in half to create the purse and sew up both sides. Now Take a G hook, sc around the top 3 times. Handle: sc in the next 5 sc, Turn, sc in the next 10 sc, chain 15, skip 16 sc, sc in the next 10 sc, chain 15, skip 16, sc in the next 10 sc, work 18 sc around the 15 chain, sc in the next 10 sc, work 18 sc around the next 15 chain, now sc around all sc and sc of the handle, for total of 55 sc, sl st. Fasten off and weave in the ends. Start with Red yarn Rnd 1. work 10 sc in the Magic circle, sl st.
rnd 3. *sl sl in the chain 3 space, ch 1, work 6 dc in the chain space 3, ch 1, sl st, *repeat until you have 5(6 petals) sl st.
rnd 4. *bpsc, ch 5, *repeat until you have 5(5 chain spaces) sl st in beg stitch. rnd 5. *sl st in the chain 5 space, ch 1, 9 dc in the chain 5 space, ch 1, sl st.*repeat until you have 5(9 dc petals) sl st to finish. rnd 6. *bpsc, ch 5, *repeat until you have 5(5 chain spaces) sl st.
rnd 7. 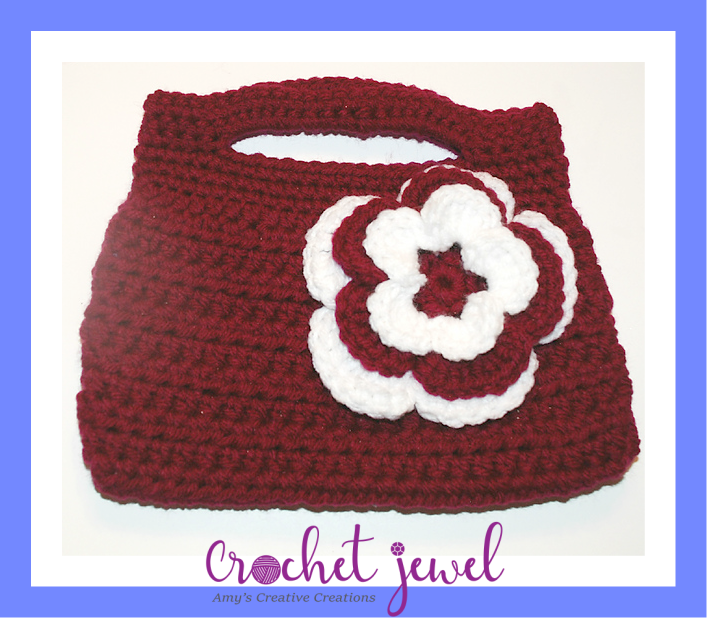 *sl st in the chain 5 space, ch 1, 9 triple crochet in the chain 5 space, ch 1, sl st, *Repeat until you have 5(9 triple crochet petals) sl st to finish, fasten off and weave in the ends, attach to the purse.